For small groups like couples, families different buildings can be connected with a hallway or tunnel to create a cluster. There are no new entries, but the existing doors are connected to a tunnel, and this new tunnel has a door then. 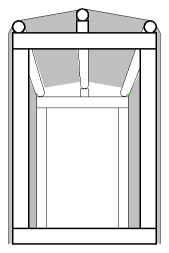 Disadvantage: connected buildings cannot be entered individually, but only through the common tunnel, therefore fire-escape way is extended. There are new entries made, where a tunnel is attached to. Advantage: existing doors remain accessible, and each building can be reached individually. 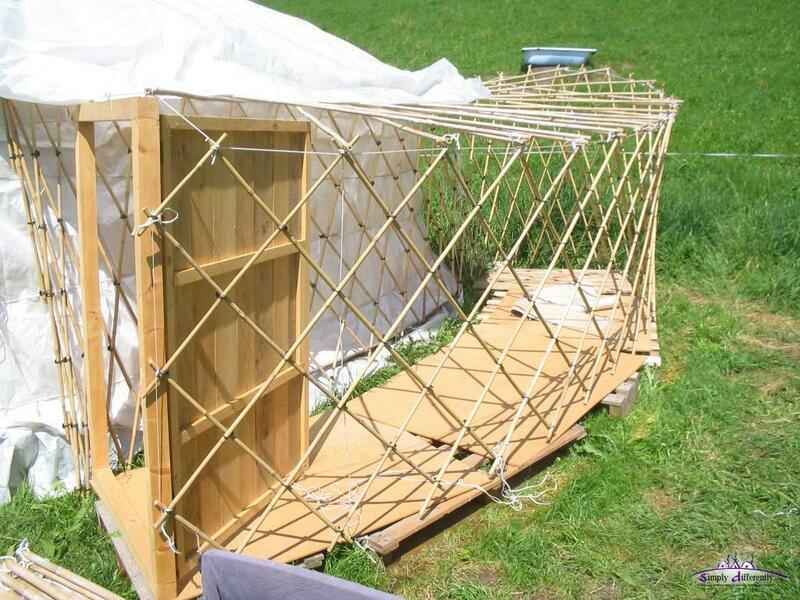 Disadvantage: new openings are required, and can be quite an overhead like in case of a yurt and its lattice wall. For couples two buildings may be sufficient, and a tunnel with a common door. For a family, with 2-4 children, the parents can live in one or two buildings, whereas the kids may get one or multiple dedicated building. For buildings with small kids it is apparent to use the tunnel connecting the existing door. 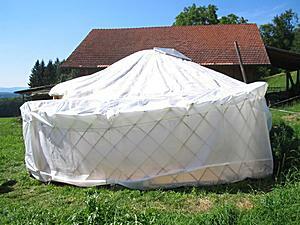 Yurt: can be clustered moderately, e.g. using tunnel-with-door approach so the lattice wall is not required to breakup additionally. 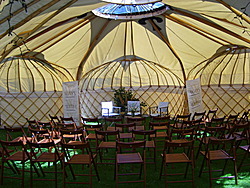 If more than two yurts are about to be combined, an additional door or entry is required. 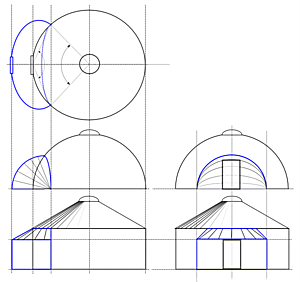 Wigwam / Bow Dome / Star Dome / Geodesic Dome: can be clustered quite well, as domes have multiple choices to make an entry or door without making big changes to the static, and so multiple choices for a tunnel is possible and clustering in many different combinations. Tipi: can be clustered moderately, e.g. using two sets of poles, and combine two tipis side-by-side with one big cover, or connecting two tipis with tunnel-with-door approach. and in case of rectangular shaped tunnels you have to make sure the rain-water does not create a dent (see illustration). As a conclusion, the different domes with their geometry are most suitable to cluster, whereas with yurts you have to break up the lattice wall in order to cluster more than two yurts together. 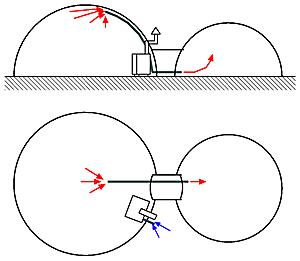 To distribute heat from the main building(s) to smaller buildings connected a pipe on the ground be be used to push warm air to the other rooms without requirement to install in each building a heat source. Important detail: intake the hot air with a fan at the top of the main building with the heat source, and blow it out in the other building on the ground, there then it will rise and mix with the colder air. 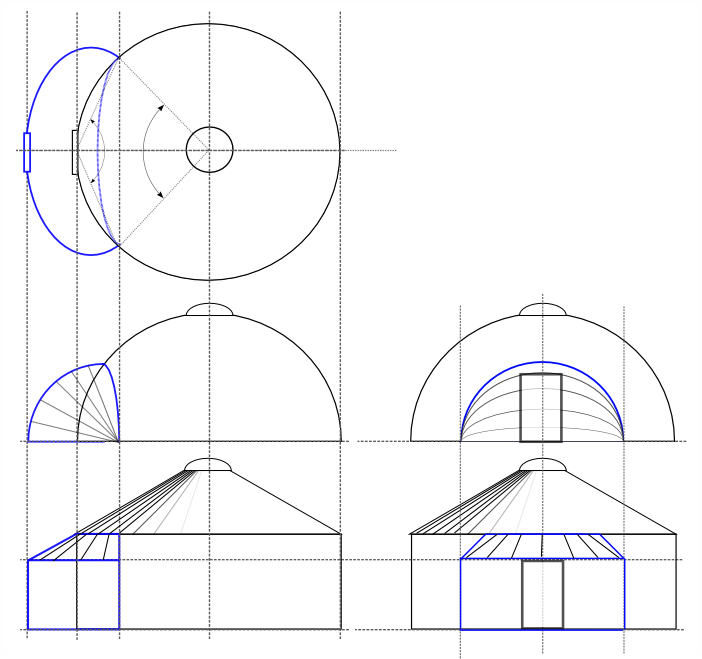 In case of a bow-based dome where pipes are used as bows, one bow or pipe could be used for the intake in the main building. This solution recommends a short tunnel, 0.5m to 1.50m max I would say, to keep the volume of the tunnel as small as possible. When the heat source is done with a stove, then a dedicated pipe near the stove in the main building providing cold and fresh air from the outside. Depending whether the room is used often (e.g. WC, shower and kitchen) it makes sense to thermal insulate it as well, and have heat from the main room reach the attached room. 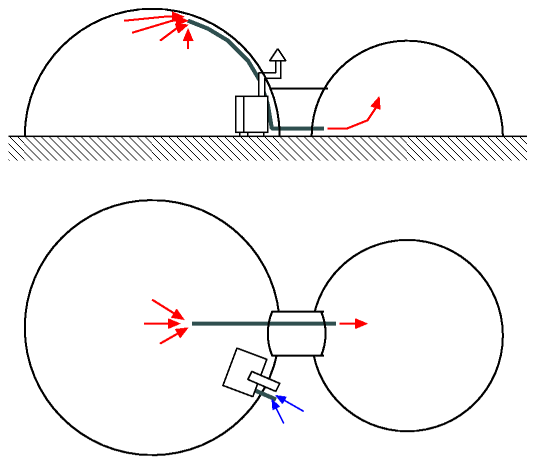 Dome: To attach a partial sphere to another sphere requires some calculations; the easiest way to do this is to have the lower junction points of both sphere may operate a connection point for bows, and those bows form a quarter sphere. With this bow approach the junction fits closely. More detailed plan will follow. 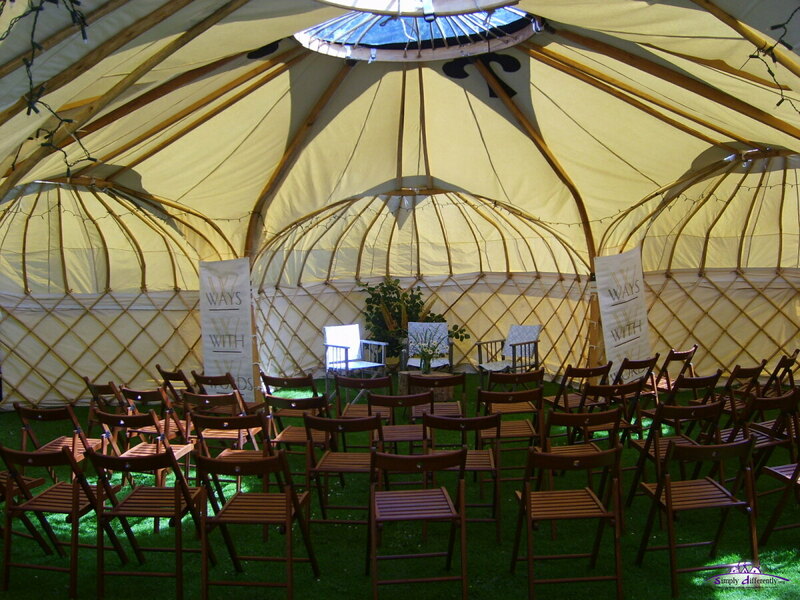 Yurt: Use a lattice wall, and just make a bit smaller than the main yurt, e.g. 1/2 diameter of the main building. 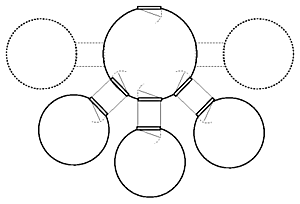 Then the roof poles of the attached room are laid on the main building, so, npoles attached room = 25% of npoles main room; this means apprx.25% of the circumference of the main building is the 60%-75% of the attached room. Overlap the roof canvas over the roof canvas of the attached room. To avoid the entry of the attached room outside gets even smaller again, keep the same size of the door frame. 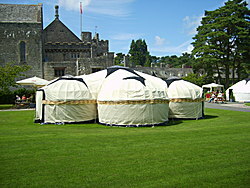 Example: Main yurt 6.4m, 64 poles. 25% of 64 = 16 poles. Attached room 3.2m (32 poles), 75% would be 24 poles/junctions. 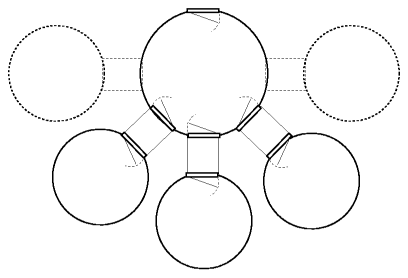 We have a discrepancy of 8 poles/junction. I would say to evenly distribute them on the lattice wall of the attached room.